During the past 12 months Jersey Water employees have worked hard to support local Mental Health charity Mind Jersey. 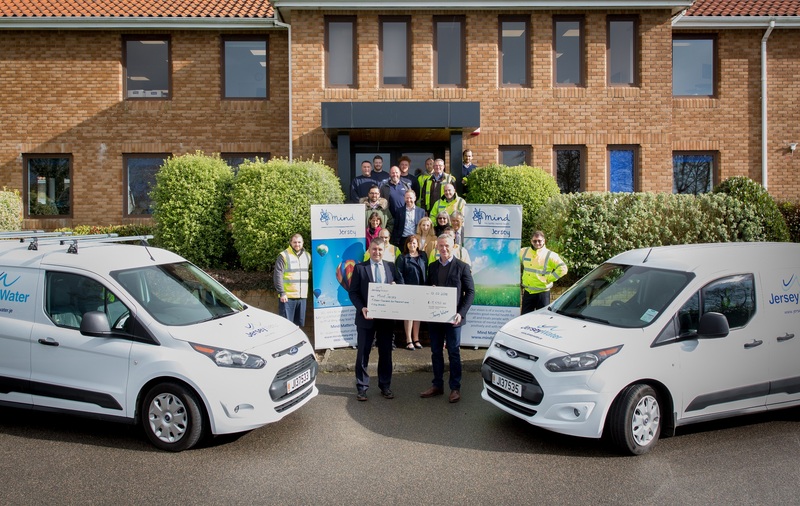 These fundraising efforts have coincided with a commitment that the utility has given to recognise the importance of supporting all staff in maintaining good mental health and wellbeing and has led to a partnership with Mind Jersey. This, in turn, has enabled the charity to deliver Mental Health First Aid training for a number of staff and follows a pattern established with a growing number of employers in a wide range of settings. The raised profile of the charity within Jersey Water led to it being chosen as charity of the year in 2017. Taken together £15,550 was raised and a cheque for this amount was presented to Simon Willing, Mind Jersey Chair, at the Westmount offices on Monday 12th February. James Le Feuvre, Executive Director of Mind Jersey, said “We are very grateful to everyone at Jersey Water for choosing our charity and working so hard to raise such a significant amount of money. One of our key priorities this year is to bring more support to local children and young people and this additional funding will make all the difference in helping us achieve this goal”.